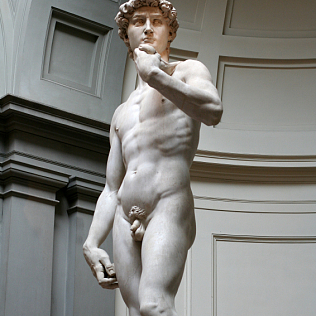 Accademia Gallery is a museum in the hearth of Florence is one of the most popular in the world because it hosts the most renowned sculptural works of Michelangelo, as his famous David, St. Matthew, Four Slaves and many others. The Accademia was founded by the Grand Duke Pietro Leopoldo of Lorraine as an educational art collection for students of Fine Arts. The gallery occupy some 14th century rooms once belonging to the ancient Hospital of St. Matthew and the old convent of St. Niccolò of Cafaggio, completly restored and renovated in late 18th century to house the famous museum dedicated to Michelangelo. In 1882 the Tribuna Hall was realized to display the David. The Gallery, along with Michelangelo\'s sculptures, shows other significant testimonials of Florentine art, sculptures and paintings, from 13th century up to 19th century. The earliest collection was enlarged with works coming from the suppressions of some religious orders and the consequent closing of churches and monasteries. A new section is dedicated instead to old musical instruments, once blonged to the Medici and the Lorraine families. Want see this museum skipping the line?